A slightly edited version of this article was originally published in the September, 1989 issue of Monitoring Times magazine. A few minor changes have been made to bring it somewhat up to date. As a general background article, this piece remians highly accurate. For surprise and mystery - new stations, frequencies varying across the dial, stations coming and going unpredicatably - nothing compares to shortwave radio in Latin America. Yet, in the turbulent Latin American broadcasting scene, never have so many changes happened so often as in Peru in the 1980s. In the past decade, more than 100 new shortwave stations have started broadcasting from Peru. Many don't last very long, but there's been a never-ending parade of new ones to take their place. Unpredictability is just one of many reasons that DXers find Peru, land of the ancient Inca Indians, one of the world's most fascinating DX countries. Starting in 2000 B.C., Indian civilizations periodically rose and fell in Peru, each building on the knowledge of its predecessors. The greatest of them all, the Inca Indians of southern Peru's Cuzco valley, began their march to civilization around 1000 A.D. Combining a highly centralized civilization with military conquest, by 1450 they controlled western South America, from present day southern Colombia to central Chile. Their empire was linked by a road network better than any in Europe at that time. On terraced Andean mountainsides, they grew potatoes and grains especially suited for the harsh mountain climate. A system of government storehouses kept several years supply of food so that even in the worst of times, no one went hungry. At the height of its glory, the Inca empire fell in one quick swoop. In 1532 a Spanish adventurer, Francisco Pizarro, and a small band of soldiers landed on the coast. 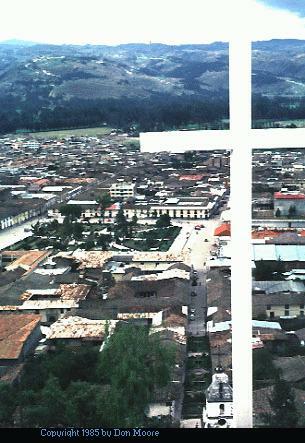 At Cajamarca (52K JPEG photo of city), the Spanish used treachery to ambush and capture the Inca emperor Atahualpa. Atahualpa was promised his freedom if his vassals filled a room with gold. They did, but Pizarro broke his end of the deal, murdered the Inca ruler, and marched south to Cuzco to complete the conquest of the now leaderless empire. The Incas never totally accepted their defeat. Remants of the civilization hung on in the mountains north of Cuzco until 1572. Reduced to near slavery, the Incas periodically revolted as late as 1814. In 1780, they nearly succeeded in retaking their country from the Spanish. However, when independence from Spain was finally obtained in the 1820s, it was the Peruvian-born Spanish elite, not the Indians, who controlled the country. Although smaller than the Inca empire, modern-day Peru is a large nation - over a half million square miles in area. The population is sparse twenty million. Around eighty percent are descended from the Incas. Many live much as they did five hundred years ago, except for a few modern coveniences such as battery radios and plastic water jugs. The Inca language, Quechua, is their mother tongue. Nearly two million don't speak Spanish, especially in the central and southern parts of Peru's Andean region. Geographically, Peru is a land of extremes. More than 40 percent of the population live in the costa, a narrow band of coastal desert, broken by lush irrigated oasises. Here are found the major cities, such as Lima, Trujillo, and Chiclayo, and most of the country's paved highways. Dissecting the country, north to south, is the sierra, the backbone of the Andes Mountains, reaching as much as 24,000 feet in height. Half of Peru's population lives in the mountain valleys and plateaus, and sometimes on the mountains themselves, once the heart of Inca empire. From the smallest villages to the important cities of Cajamarca, Huancayo, Ayacucho, and Cuzco, most of the towns were originally Inca settlements. With the exception of a few railroads in the south, this rugged area is mainly reached by rough dirt roads, frequently little more than paths. East of the Andes is the selva, the Amazon jungle. Although it covers almost two thirds of the country's area, only five percent of the population lives there. The only city here is Iquitos, Peru's 'Atlantic port'. The city lies two thousand miles from the Atlantic ocean, but the Amazon is deep enough that ocean-going vessels can dock in Iquitos. The Peruvian government believes the country's future lies in exploiting the natural resources of the selva. Development has already begun, with the discovery of oil fields ranging from the Ecuadorian border to as far south as Pucallpa. Because of the country's varied geography, shortwave radio has played a major role in the development of communications in Peru. As in most of Latin America, when commercial radio first began in Peru in the 1920s and 1930s, there were just a few stations in main cities, trying to reach a national, or at least regional, audience. They couldn't easily do this on AM, especially with the lower powered AM transmitters of the day, so shortwave was added. As a cheap and cost effective way to broadcast to a large area, shortwave couldn't be beat. Up until the 1950s, most Peruvian shortwave stations were in the larger cities. However, beginning in the 1950s, and continuing into the 1960s, several dozen shortwave stations were founded in the departmental (state) capitals and other principal towns of the Andean highlands. Listeners preferred tuning in these local stations. Because audiences in the far flung areas declined, some big city stations began to shut down their shortwave transmitters, but shortwave radio in Peru was by no means dying. Instead, a new era was about to begin. By the 1970s, stations began to pop up in the smaller towns, especially in northern Peru. Located in remote Andean valleys and the river towns of the Amazon jungle, the new stations have found shortwave to be indispensible. First, stations need shortwave to reach many rural mountain villages and jungle settlements. Secondly, without a telephone system in rural Peru, and extremely slow postal service, shortwave fills the communication gap. Commercial shortwave radio is the principal method of communication between provincial towns of the Andes and Amazon jungle. The government uses it. Businesses use it. Listeners contact distant family members and friends. Paid personal messages, called "comunicados" or "servicios sociales" are broadcast to reach distant areas. It took time to get radio into these remote areas. The northern department (state) of Cajamarca is a good example. Cajamarca was an important region under the Incas, and today is the agricultural breadbasket of northern Peru. Yet, as late as 1978 the only radio stations in the department were in the capital city of Cajamarca, and Jaen, the main town of northern Cajamarca. Other departmental towns, were thought to lack a big enough local market to support a radio station. Additionally, with no electrical service, or perhaps only a few hours nightly via a weak municipal generator, there was no available power supply. However, in 1978 a group of Chota's citizens (a provincial, or county, capital north of Cajamarca) realized they could put a station on the air if they bought their own generator. To get a station underway, they hired an experienced engineer, Mauro Vasquez Gonzalez, from Trujillo. Mauro set up a diesel generator, transmitter, and antenna on the outskirts of Chota. The downtown studio was powered by car batteries, charged at the generator site. To the surprise of many, the station made money. Radio Chota proved that local radio stations were feasible. Since then, at least fifty different shortwave stations have been on the air at one time or another from Cajamarca department. Unlike Radio Chota, many of these have not been successes lasting only a few weeks or a few months, before being closed down by economic reality. Still, one or two which have made it in each town, and there is always a potential station owner willing to gamble on a new station. With the possible exception of Peru's jungle department of San Martin, probably no other similarly sized area of the world has seen so much shortwave activity in such a short period of time. Nobody, including the Peruvian government, knows how many shortwave stations are on the air in Peru at any time. Around a 100 would be a good guess, however. A few stations remain in coastal cities, especially Lima, but not many. Most older stations remaining on shortwave are in principal towns and departmental capitals of the Andes including stations such as Ondas del Huallaga, Radio Andina, Radio Huancavelica, and Ondas del Titicaca. Many of these long established stations broadcast in the 60 meterband, although a few can be found in 90, 49, and even the 31 meterbands. For the most part, they use medium powered transmitters, usually at least five kilowatts. In general, these are the easiest Peruvian station to hear, although "easy" is relative. They are not as easy to hear as similarly powered stations in Central America, Venezuela, or Colombia. Also, as is frequently the case in Latin America, the stations might go off the air for months or years at a time, before suddenly reappearing. By any standards, these are real DX challenges. New small town broadcasters provide an even greater challenge. Few use more than a kilowatt; many use less than half that. To the DXer's advantage, however, most use frequencies outside the nominal shortwave broadcasting bands, especially in the 4200-4500 khz, 5100 - 5800 kHz and 6250-6950 khz areas. Because the licensing process takes at least two years in Peru, many stations come on the air first, and then worry about becoming legal. So, they take whichever frequency they feel like, or, more likely, whichever one they happen to have a cristal for. Occasionally, a station even pops up in the 80 or 40 meter ham bands, in which case they're probably using a converted ham transmitter. While some of these out-of-band stations are constantly covered in North America by interferance from utility stations, others have clear channels, as long as conditions permit their weakly powered signals to be received. Unfortunately, when licensed, some move to authorized in-band frequencies, where they are usually covered up by more powerful stations from elsewhere in Latin America. Adding to the DX challenge - and fun - is that the broadcasting scene is constantly changing. Competition in these small towns is stiff, and overhead is high. Just buying kerosene for a generator is a major expense. Considering that many small stations don't gross more than ten or twenty dollars a day, it hard to see how they have money left over for equipment and records. If there is an equipment breakdown, expensive replacement parts must be ordered from Lima. It may take months before the owner saves enough spare cash from his other businesses to fix the transmitter. Despite the successes of a few stations such as Radio Chota, many do fail. Frequently new stations come on the air, are heard well for a few weeks or months, and then are gone forever. It can seem like new stations come and go on a daily basis, teaching DXers to catch new station today, because it may be gone tomorrow. Because of the difficulties of radio broadcasting in this part of the world, it's not unusual for stations to go off the air for several days, weeks, months, or even years. When an inactive station reappears, it's a good idea to make sure it really is the old station. Afterall, the owner may have decided to call it quits and sell the transmitter. In rural Peru, you never know for sure just who owns the transmitters, since some change hands frequently. For example, in the early 1980s, Radio Acunta came on the air from Chota with a 100 watt transmitter on 5800 khz. Later, the transmitter was moved to Bambamarca and rented to Radio San Francisco, a new station. However, Radio San Francisco didn't make it and the transmitter was soon back in Chota. By mid 1985, Radio Acunta was having a tough time competing with crosstown rivals Radio Chota and Radio San Juan de Chota, each of which had a one kilowatt transmitter, so manager Victor Hoyos called it quits. The transmitter was sold, and ended up in San Ignacio, by the Ecuadorian border, where for several years it was used by Radio San Miguel Archangel. Radio San Juan de Chota didn't last much longer, and it's transmitter was sold to another new Bambamarca station, Radio Onda Popular. In the late 1980s, Radio Nuevo Cajamarca from the town of Nuevo Cajamarca, near Rioja, was heard on 5800 khz. This was probably the old Radio Acunta transmitter with yet another owner. Another 'musical transmitter' got its start in Moyobamba, on the fringe of the Amazon jungle. In 1982, Radio Moyobamba announcer Miguel Quisipotongo Suxe, founded his own station, Estacion C, using a 300 watt Framvel transmitter with a cristal for 6364 khz. The Moyobamba area is growing fast, and Miguel made enough money to invest in new equipment. He bought a higher powered transmitter, with a crystal for 6324 khz, he sold the 6364 transmitter to another ex-Radio Moyobamba announcer, Porfirio Centurion. Porfirio called his soon-to-fail station Radio Moderna. A few months later the transmitter ended up in nearby Saposoa, where it was used to broadcast under the name Radio Huallaga. There's no telling who owns the transmitter now. Confusing as it may be, there is a silver lining for the DXer. By station counting standards, if a station name change is accompanied by a change in ownership, it can be counted as a new station. Therefore, over several years, it is possible to log the same transmitter on the same frequency three or four times - and count it as a different station each time! In North America, the morning is the best time for Peruvian reception. Stations began signing on at 0900 UTC, with most on the air by 1000. The stations can be heard until fadeout at sunrise, which in the winter can be as late as 1200 on the East Coast. In the summer, the opening can be almost nonexistant. Peruvians can also be heard in the evening, occasionally as early as 2300 in the winter, later in the summer. Usually the best reception is after 0200. Most stations sign-off between 0400-0500. Unfortunately, many smaller out-of-band stations do not sign on until 1200 or later, so they can only be received in the evening. For the most part, Peruvian stations broadcast in Spanish, and knowledge of Spanish helps in identifying them and picking out program details for reception reports. However, many stations in the central and southern Andean regions also broadcast in Quechua, which can be easily mistaken for Spanish. Although the two langugages are phonetically very dissimilar, Quechua has borrowed hundreds of Spanish words. Quehcua is not the only Indian language used by Peruvian broadcasters. In the far south, around Lake Titicaca, a few stations broadcast in Aymara, a language widely spoken there and in neighboring Bolvia. Aymara, too, has borrowed numerous words from Spanish. Many Peruvian stations heard on shortwave do not have set formats, like North American AM/FM stations. Instead, they program various types of music throughout the day, depending on the expected audience. The first program of the day is nearly always a wake-up program aimed at the campesinos, or peasant farmers. Other than a few crazy DXers, who else would listen that early in the morning?! These programs usually have names such as Amanecer Campesino (campesino dawn), Mananitas Campesinas (campesino morning) or Buenos Dias ... (Good morning + name of town or province). The announcers are upbeat, give frequent time checks, and sometimes even chastise their listeners with "Levantese! Levantese!" (Get up! Get up!). Since campesinos like folk music, this is the best time of day to hear traditional Peruvian huaynos (pronounced 'whinos'). The most popular music of rural Peru, the huayno features a rapidly strummed guitar and high pitched vocals. It is frequently accompanied by a quena (traditional wood flute), zampona (bamboo panpipes), charango (a small guitar like instrument), arpa (harp), or guitarra. Many DXers soon develop a liking for these exotic, haunting melodies. A good example of the sound of these instruments, and Andean music in general, is Simon and Garfunkel's song "El Condor Pasa". Although many of the instruments are the same, huaynos are different from the Ecuadorian music played on HCJB. Other programs follow throughout the day: romantic music for housewives, pop music for teenagers, radionovelas (soap operas) for everybody. During evening hours, in fact, just about anything can be heard - although usually in program blocks. Don't be surprised if an hour of rock music is followed by syrupy romantic music, or fast moving tropical music. Each of these programs has its own name, such as Discoteca de Hoy, La Hora de Amor, or Fiesta Tropical. DXing the Peruvians is challenging; there aren't many DX frontiers as hard as to crack as this one. Still, with a serious effort and dedication, it's possible to log 25 or 30 stations in just your first year. The way the stations come and go, many DXers with five or six years experience have logged more than 100. Resources such as Passport to World Band Radio, log columns such as that in Monitoring Times, and an atlas with the departments clearly marked, are indispensible to DXing the Peruvians. However, the most important step in successfully DXing Peru, is keeping up on late-breaking DX news, so that when a new station comes on the air, you can try for it before it has a chance to shut down. Listening to HCJB's DX Party Line program is the best way to keep up with this changing scene. When sending reception reports to Peruvian stations, write in Spanish, and include mint stamps for return postage. At the moment, however, Peruvians are not particularly good verifiers. The Peruvian economy is a shambles; inflation in 1988 was around 2000%. Under these conditions, most stations don't have the money or staff time for verifying. Many DXers report return rates of only ten or twenty percent on their Peruvian reports. Of course, any reply which is received is that much more treasured because of its rareness. It's unlikely that the economic situation will improve before the 1990 presidential elections. If the ecomony does improve, maybe DXers will see the return of easier verifications that often included pennants. For a complete list of Peruvian shortwave stations, the best references are the annual publications Passport to World Band Radio and the World Radio TV Handbook . These are available from various shortwave vendors. This article is copyright 1989 by Don Moore. It may not be printed in any publication without written permission. Permission is granted for all interested readers to share and pass on the ASCII text file of this article or to print it out for personal use. In such case, your comments on the article would be appreciated.